A few years ago we met up at the local post office with a distant neighbor who commented on how huge our pig was getting. She went on to tell us that she always looked for the pig each time she drove past our house and that she was almost always able to find him moving around somewhere in our fenced-in gardens or yard. She said she had always thought that pigs were destructive diggers, and that ours must be a most unusual pig to be allowed to roam freely throughout our gardens without damaging our flowers and plants. This woman’s comments about our pig came as a pretty big surprise… especially because at that time we did not have a pig! In fact the only pig around was this life size concrete pig that we call Horace. We found Horace in an antique store in Canada many, many years ago. 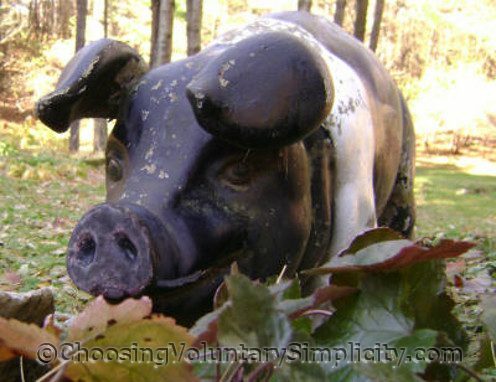 I’m not usually a fan of garden “art”, but this pig looked so realistic… and personable…! So how did I convince this woman that the pig she thought she had been watching grow to such a massive size… and had seen running around the yard and garden… was not a real pig at all? How did I make her believe that the pig she had seen was actually made of concrete… and that it had been in the same spot for many years, with the steel rods in its feet firmly embedded in the ground? I have no idea… I never managed to convince her. This neighbor always insisted the pig SHE saw was alive. It HAD to be alive, she said, because she had seen it move. Maybe it’s a magical pig! If it’s fooling the neighbor on purpose it’s a thoughtless little pig. Laughing now and thinking back to the “Can” Trailer. As I say let some people think in what they want to think and laugh it off. Thanks for the funny either way. Great story. Some people just can’t admit they made a mistake. Love the PIG! Oh dear, that was such a laugh! I think sometimes our eyes play such tricks on us that it’s just impossible to give it up! Did you get her within touching distance of the concrete pig? Maybe if she actually puts a hand on it it will break it off for her lol. I can understand her though. It took me several seconds to realize the pig in the photo was a statue lol – and it was a close up in still form, not a quick glimpse from a road far away while driving! So that is definitely a realistic looking pig!